The wife of the President, Mrs Aisha Buhari, has accused the All Progressives Congress of allowing impunity to take place during its primaries. According to her, some aspirants were given automatic tickets, denying others who also bought the party’s forms “at exorbitant prices” a fair chance. She made her position known in a series of tweets on Sunday. “It is disheartening to note that some aspirants used their hard-earned money to purchase nomination forms, got screened, cleared and campaigned vigorously yet found their names omitted on Election Day, these forms were bought at exorbitant prices,” she said. She explained that it was important to speak out in view of happenings during the primaries, to give a voice to the voiceless and called on Nigerians to rise against impunity. 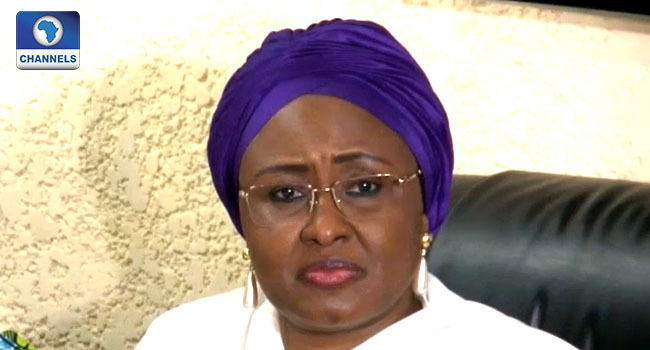 Mrs Buhari’s outburst comes after the Adamawa state governor, Mohammed Jibrilla, emerged as the winner of the governorship primary election in the state. He polled 193,656 votes to defeat two other candidates, Halilu Mahmoud and Nuhu Ribadu. She, however, did not mention names or give instances where automatic tickets were handed out. Mrs Buhari also advised voters to ensure that they only back candidates who are committed to the provision of basic amenities. She is saddened that “such impunity could take place” despite the “All Progressives Congress being a party whose cardinal principle is change and headed by a comrade/ activist whose main concern is for the common man”. She added, “Given this development one will not hesitate than dissociate from such unfairness, be neutral and speak for the voiceless. “It is important for the populace to rise against impunity and for voters to demand from aspirants to be committed to the provision of basic amenities such as 1. Potable drinking water 2. Basic health care (Primary Health Care centres) 3. Education within conducive and appropriate learning environments. Her complaints come hours after the APC affirmed President Muhammadu Buhari as its candidate for the 2019 Presidential election. Some 7,000 delegates affirmed the outcome of the September 28 direct presidential primary of the party and confirmed the candidature of the President on Saturday at the party’s national convention which was held at Eagles Square in Abuja. While the President was unopposed in that primary which was hitch-free, some of the party’s other primaries have generated controversy.